It looks like Comcast is blocking remote assistance sessions from Verizon FIOS. I can connect fine from FIOS a PC on Hargray.com and Kuhncom.net networks, but when I try to connect to my mother's PC on Comcast, the initial connection attempt times out. When I use Verizon Wireless' EVDO Broadband network it connects without issue. There are no differences in PC configurations between the two connections. I am using my X60 in all scenarios, and since I can connect to other individuals on different networks using FIOS, I have to assume that Comcast is in fact blocking remote assistance connections from FIOS. Comcast has already been chided by the FCC for its stance on Net Neutrality slowing and/or blocking peer to peer traffic. At yesterday's FCC's open public meeting (Gigaom article) on the subject at Stanford, they failed to show up. Comcast is already a lousy cable TV provider, now they want to add lousy to their Internet service. As competition grows from Verizon FIOS and others, I would think they would want to rethink their strategy but they seem to have their head in the sand. I also have to chide Verizon and the other large telecoms for not showing up at this meeting. I can understand that telecoms don't want more regulation, but if they want to avoid it they need to reign in the likes of Comcast. This is not a positive environment for the consumer and I believe Congress needs to take some action. Direct access to the clock plug in by tapping the time. Direct access to the weather plug in by tapping the weather icon. Unfortunately, they have not added functionality to trigger 3rd party PIM like Pocket Informant (other than MS and their own) from a displayed appointment or the calendar. All in all though this is a worthy upgrade. pocketnow.com has just published a review (link). The power went out around 8:10 am (I will have to check my logs for the correct time). My Wireless network is and FIOS are still up and running thanks to my 3 APC BACK-UPS ES-350 bricks I have my network equipment attached to (my setup). This will be a good test of my setup and how FIOS handles power outages. My XPS 720 attached to an APC RS 1300 LCD shutdown in an orderly fashion after it determined that it only had 5 minutes of power. It is now 8:35AM (25 minutes), I will update this thread periodically. 2 of my BACK-UPS ES-350 were beeping. I need to load up the APC software on my laptop and plug into the units to shutoff all alerts. It is too bad you can't shut off the beeping directly on the unit. It looks like the XPS 720 is set by default to hibernate rather than shut off when instructed to shut off by the UPS. A nice feature, but during the 5 minute power restore the system did not come out of hibernate correctly. I was told by Dell tech support on a earlier call about a USB issue, that they had issues with sleep mode and USB devices which is fixed in Vista SP1. Maybe this is related (further investigation required). The Thecus SATA hard drive array attached to my Directv HR20-700 DVR did not turn back on after the power was restored.The DVR rebooted from the internal hard drive. This situation would not be good if I was away since my To Do list on the internal drive is empty (you can only one drive, internal or external). I am sure this is by design to protect the disk array, however I need to investigate potential solutions. It looks like the outage affected about 73,000 homes in Northern, no word on what caused it. Third time was a charm. My Directv 5 LNB dish and HR20 DVR were successfully installed yesterday. When my Sony KDL46XBR2 was delivered in early January, I called the Directv retention team (based on advice from this forum) and was able to get the HR20 DVR for free and a free year of DVR service. They scheduled me for a March 19th install. March 19th came without an installation, the installer had an accident (fair enough) but no one contacted me. Directv rescheduled for the next day, an installer and supervisor showed up. Both convinced me that there was no way for me to get the HD signal because of how they have the angle the oval dish and our large trees. I did not push it since their explanation seem plausible and I had read of many individuals (including Walt Mossberg who lives in the DC area) living near tall trees being unable to receive the HD signal. However a week later, I talked to a neighbor who had the same experience but he pressed and the installer found a line of sight. I decided to try the stronger tack and to reschedule my installation with Directv. Unfortunately they had canceled the order and could not reactivate it. I had to create a new order, customer service called me back and could not give the deal from my previous order. I had to call back and talk to the retentions desk. I did but they did not want to give the HR20 for free, after strongly objecting that it was not fair, they told me that I should never have gotten this deal in the first place. At this point I had two choices, give up on Directv or pay. I ended paying $334.90, receiving a $105.00 credit and 1 year of free HD DVR service. This is pretty pathetic customer service for someone who has been with them 10 years. I plan on writing the CEO on two fronts, one that they should honor their original deal with me and two the fact that they may be losing a lot of customers due to incompetent or ill-trained installers. After discussing the situation with the installer, showing the dish on my neighbors roof, he agreed to check the signal on the roof. He took up a test dish and meter (the original installers never did). Within minutes he found a suitable spot. We decided to put the dish as close to the top of the roof line to make sure I got the best signal possible. I am now getting 100 for many of the transponder on the Tivo upstairs and downstairs in the family room the HR20 is in the mid 90's due to the long cable run. I think that is pretty good signal strength given the comments of the previous installers. The signal on the Tivo is better than what I had before. It detected the external hard drive immediately. I enabled network access so I don't have to use a phone line (very easy). HDMI seems to be working well, I did have to enable valid resolutions in the settings and pass through mode (hold down the format button). The Sony seems to be a little slow to recognize resolution changes but it works, unlike with the SA 8300HD. Dolby Digital only works with certain channels so for now I am using PCM. Switching is not that easy (too many keystrokes). Given that not all channels are transmitted with Dolby Digital audio, there should be one button on the remote to switch back and forth. The ATSC off air receiver does not seem to be as sensitive as the Sony's. I am using a split off of my Terk stick UHF/VHF antenna which works fine on the Sony but flaky with the HR20. I may need to purchase a Terk HD antenna if I want to use off air channels. I love being able to record PPV movies and only pay for them when we watch the recording (press R to record PPVs in the guide). Also recording PPV movies allows us to watch them over several days, unlike the 24 hour limit with Comcast and Verizon FIOS. This is much more like renting a DVD and fits our viewing habits much better. The one problem I have with the installation, are the two little dongles for MPEG4 that need to be connected to the satellite inputs. It makes sliding the HR20 all the way back in my tight cabinet tough. I will have to reroute them elsewhere. I am much more pleased with the HR20 than with Comcast's SA 8300HD. 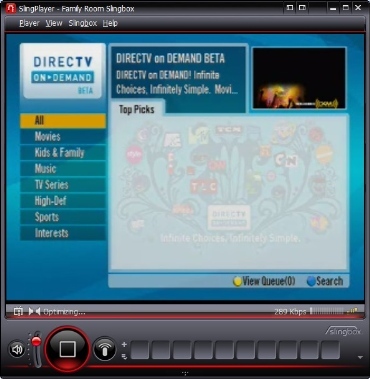 It is clearly a step or two above, however the UI is still not as easy as the Tivo.